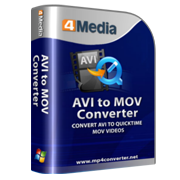 4Media AVI to MOV Converter is an easy-to-use converting tool that enables you to convert AVI video to QuickTime MOV video. With it, you can also create QuickTime video from JPG, GIF, PNG and BMP images with excellent image quality. 4Media AVI to MOV Converter is specially designed for the AVI to QuickTime MOV video conversion with the fastest speed and excellent image/sound quality. And it is also an image video converter that can turn your pictures in JPG, GIF, BMP and PNG formats into MOV video for watching your pictures using QuickTime player. With useful editing tools, you can split an AVI file, compute video bit rate, convert any video clip, preview the original and the output video, take a snapshot, and so forth. Free download 4Media AVI to MOV Converter and enjoy your colorful entertainment life now! 4Media AVI to MOV Converter can convert AVI video to QuickTime MOV video easily and quickly. In addition to video conversion, this AVI to MOV converter can also convert pictures in JPG, BMP, GIF, PNG formats to MOV video. Completely support dual-core or multi-core CPU and provide the highest AVI to MOV conversion speed. 4Media AVI to MOV Converter can convert two or more files in batches at the same time with only one click. Allow you to split a large AVI file into multiple smaller QuickTime MOV files with the user-defined split time or length. 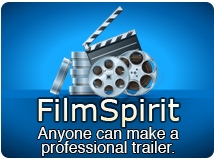 Any desired part of your AVI video file can be converted. Choose the segment by entering the start time and duration. Adjustable parameters provided in the software include bit rate, frame rate, sample rate, codec, resolution, etc. Realize one input but multiple file outputs by adding multiple profiles for one source and convert them at a time. Help you get the output file size you want using the Bitrate Calculator with the bit rate calculated instantly. After-done actions will eliminate the need of waiting for the end of conversion around your computer. Run the AVI to MOV converter in the background while converting video to save CPU resource. Get your favorite movie images by taking a snapshot while previewing. You can save them as JPG, PNG, GIF or BMP format.